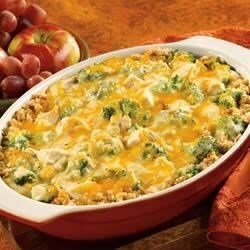 "Pepperidge Farm® Herb Seasoned Stuffing is topped with turkey, broccoli and a savory sauce made with Campbell's® Condensed Cream of Celery Soup, milk and shredded Cheddar cheese, topped with extra cheese and baked until hot and bubbly." Mix water and butter. Add stuffing. Mix lightly. Spoon into 2-quart shallow baking dish. Top with broccoli and turkey. Mix soup, milk and 1/2 cup cheese and pour over all. Sprinkle with remaining cheese. Bake at 350 degrees F for 30 minutes or until hot. See how to make juicy roasted turkey with a savory gravy. Tip: For 2 cups cubed cooked chicken, in medium saucepan over medium heat, in 4 cups boiling water, cook 1 pound boneless chicken breasts or thighs, cubed, 5 minutes or until chicken is done. We loved it! I added about 3/4 cup of dried cranberries to the stuffing mix and sprinkled about 3/4 cup of French fried onions on top. This recipe was fantastic.............the only thing I changed was I added a tsp of cayenne pepper, it added a little zing to it!! !